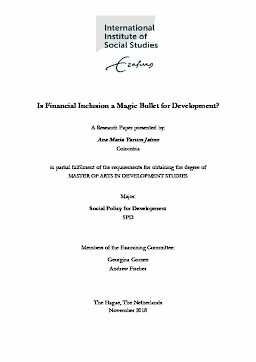 Erasmus University Thesis Repository: Is Financial Inclusion a Magic Bullet for Development? Is Financial Inclusion a Magic Bullet for Development? This Research Paper is a critical engagement with the Financial Inclusion (FI) literature that focuses on the benefits of credit for economic and social development. It questions two central ideas in this literature: 1) over-indebtedness is the result of personal irresponsibility; 2) extending access to credit to the population improves their living conditions. Through the stories of mortgage debtors in Zaragoza and Madrid, it shows that becoming over-indebted is the result of events at the macroeconomic and personal level, which are beyond debtors control. Likewise, it illustrates that holding debt stresses the households’ vulnerability, limiting their response capacity and exacerbating the consequences of negative circumstances. This RP claims for social policies that help people to cope with situations of passive over-indebtedness and protect them from its consequences. Most importantly, this RP remarks the need to consider the context and households’ vulnerability when promoting FI inclusion policies.